Chromium, as a micro mineral in the feedhas developed a kind of an ambivalent relationship with the poultry industry, owing to the myths and certain incidences in South Asian markets. Therefore, there is a need to reanalyze the Chromium safety and its feasibility in poultry industry as why there is a needuse Chromium in poultry diets. Heat stress induced hyperglycemia, which leads to less utilization of glucose by the cells thereby, causing a further energy deficiency in addition to reduced feed intake. To understand how Chromium can help in efficient utilization of nutrients, we need to understand its mechanism of action (MOA) (refer picture 1). Chromium is an essential part of Glucose Tolerance Factor (GTF). GTF is synthesized in vivo from absorbed dietary chromium, and acts as a physiological enhancer of insulin activity, binding to insulin and potentiating its action about three-fold. 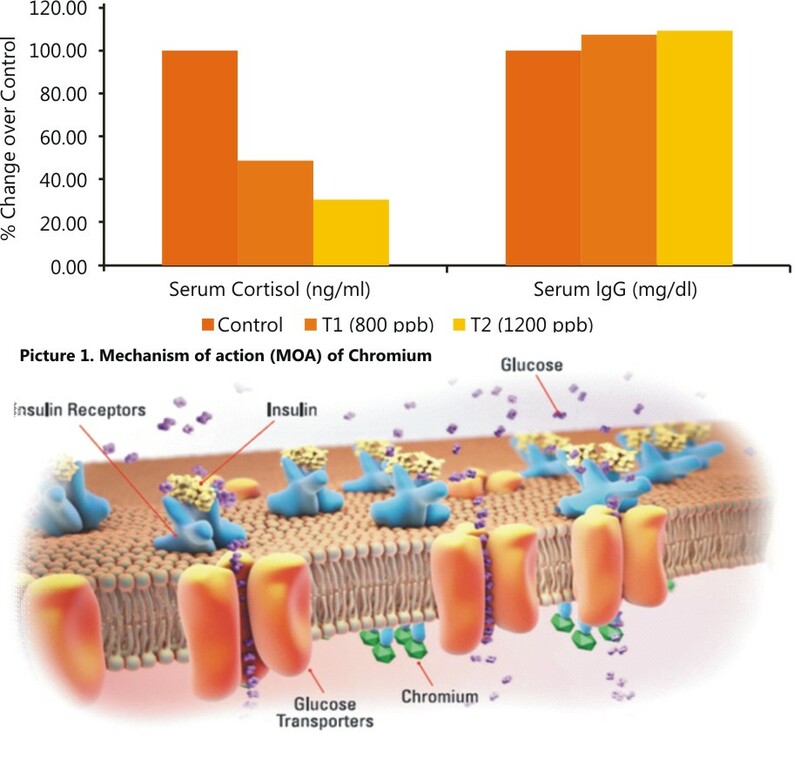 Chromium affects insulin by binding to a low molecular weight oligopeptide named chromodulin(Insulin receptors) (Vincent, 2001). Chromodulin tightly binds four chromic ions and amplifies insulin receptor tyrosine kinase activity; thus, it enhances insulin action. This enhanced insulin activity helps in glucose clearance from blood and increased uptake in to the cells, leading to better utilization of nutrients from feed. Cortisol has been found to be immunosuppressive, inhibiting the production and actions of antibodies, lymphocyte function, and leucocyte population. Reduced feed intake and high cortisol levels has also been related to reduced weight of thymus/lymphoid organs. Reduced immunity in summer or normal stress periods makes the bird more vulnerable to viral infections and mortality. In various studies it was found that Chromium helped to improve the immune status of the bird either by directly effecting cytokines or by reducing glucocorticoids. Every day, poultry goes through various stress’ like production, crowding, heat, mycotoxins, viral and bacterial infections, transport etc. 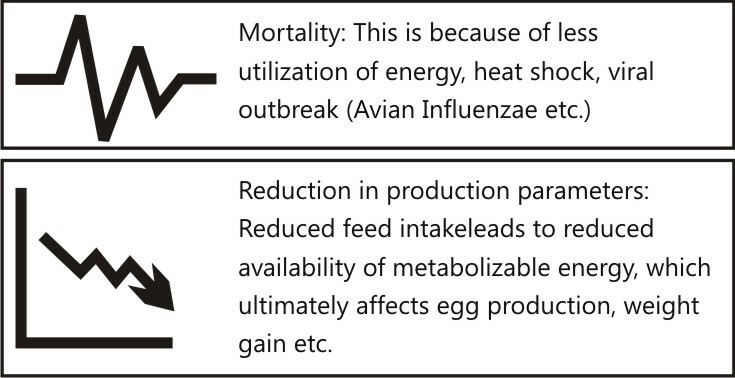 As the breeds’ productivity increases, the sensitivity towards external stressors also gets increased which leads to a higher average mortality rates and more vulnerability to infections.Stress has 2 major implications on the poultry bird Chromium being a part of GTF helps in efficiently utilizing the nutrients and helps in increasing the energy availability from the feed, and on the other hand, as it boosts immunity, helps to combat viral and bacterial problems. Several studies have shown that during stress due to release of corticosteroids there is an increase in fat deposition and reduction in muscle protein(Foury et al., 2005). As suggested before, Chromium supplementation helped in reducing corticosteroids levels which certainly will help to prevent loss of protein and reduce deposition of fat which will ultimately lead to better carcass quality. It was further substantiated by Rajaleksmi et al (2014) that after supplementation of Chromium in broiler diets, breast meat yield improved linearly. There was 8% extra breast meat and 3% extra meat when Chromium inclusion was increased linearly. Inorganic sources of Chromium are highly ionic and dissolves readily before duodenum which allows interaction with other nutrients in the diet. Anderson et al. 1989 found that only 0.4%-3% of inorganic Chromium can be absorbed while Chromium from organic sources can be absorbed 10-25%. Various studies have proven the benefits of using organic form of minerals over inorganic sources. Chromium is no exception to this. Organic sources of Chromium are 10 times more bioavailable then inorganic sources. Barbara Król et al. 2016. Interestingly, Chromium Propionate is the only form of Chromium which is USFDA approved for use in poultry. 600ppbOrganic Trivalent Chromium and 250mg Ascorbic acid yielded the best result in terms of feed intake and Feed Conversion ratio (FCR). Same was observed by Li et al with Chromium in combination with Vitamin E.
Also, Chromium in combination with Ascorbic acid has synergistic effect. Chromium by potentiating action of insulinhelps in transport of Vitamin C which further helps to provide a protective effect on pancreatic tissue. Chromium supplementation through water in poultry farms helps to improve the immune responses, which is an important benefit as stressed birds are more prone to contract viral infections. As a good farm practice recommended dosage of Chromium, especially in most prone times of the year, can help in preventing viral outbreaks. Chromium, being a transition element occurs in +2, +3, +6 forms. But, only +3 and +6 states are stable. Hexavalent (+6) Chromium is highly toxic, poorly absorbed and may cause nephrotoxicity and hepatotoxicityand is also a potent carcinogen. Chromium frequently contaminates poultry feed through inclusion of leather meal containing tannery waste. Trivalent (+3) Chromium forms are generally considered safe if/when used in needed concentration. Propionate, chloride are all trivalent forms. NRC has provided a maximum tolerance limit of 500,000 ppb while the recommendations are as low as 600ppb, this rules out the question of toxicity. Even for humans, daily adequate intake has been defined by Institute of Medicine, Food and Nutrition Board, 2001. In conclusion, it is fair to say that Chromium has gained a great confidence among the scientific community which approves of its requirement and application in poultry industry. If used rationally and at recommended dosage it offers a better health and production opportunity.